Governor Charlie Baker spoke during the GOP state convention held at the DCU Center in Worcester on Saturday. WORCESTER — Governor Charlie Baker was given a strong endorsement for reelection Saturday from delegates to the Massachusetts Republican convention, but, in a major setback, fell short of avoiding a primary fight with a controversial antigay pastor from Springfield. Baker won 69.8 percent of the 2,400 GOP delegates who showed up at the Worcester gathering. His only rival, Scott Lively, a fringe candidate with hardly any staff or fund-raising, managed to win 27.7 percent of support from delegates, easily clearing the 15 percent threshold of delegate support to qualify for the primary ballot. The convention delegates also, after two rounds of ballots, endorsed state Representative Geoff Diehl, a leading pro-Trump voice in the state, for the party’s US Senate nomination to oppose Democrat Elizabeth Warren. But the four-term Whitman lawmaker will face a fight in the Sept. 4 primary election from former GOP state official Beth Lindstrom of Groton and Winchester businessman John Kingston, both of whom also garnered more than 15 percent of the vote. Lively’s unexpectedly strong showing will force Baker, whom many national polls name as the most popular governor in the country, to spend the next four months courting Republican voters in the Sept. 4 primary — instead of focusing solely on his Democratic opponents. Lively’s vote was a major victory for a small but active ultraconservative wing of the state GOP, which expressed anger over Baker’s refusal to support President Trump, his liberal social policies, and his close working relationship with Beacon Hill Democrats. After the vote, Baker, who supports abortion rights and gay marriage, told reporters that his GOP opponent’s views are outside the mainstream. Baker refused to answer questions about whether he would debate Lively. While under fire from the conservatives for not supporting Trump, he also declined to answer whether he would back Trump’s reelection in 2020. “If he won’t debate, it’s because he knows he will lose,’’ he said. When asked how, with just $23,000 in his campaign account and virtually no staff, he can compete with the well-financed, heavily staffed Baker, Lively turned to his faith. Lively’s show of support followed an impassioned speech that struck strong pro-Trump, social conservative, and pro-gun themes. “The Baker people and the RINOs [Republicans in name only] in this room, they tell all the rest of us that a conservative can’t win in Massachusetts. You know why they say that? They say that because they don’t believe in real conservatism,” Lively said. 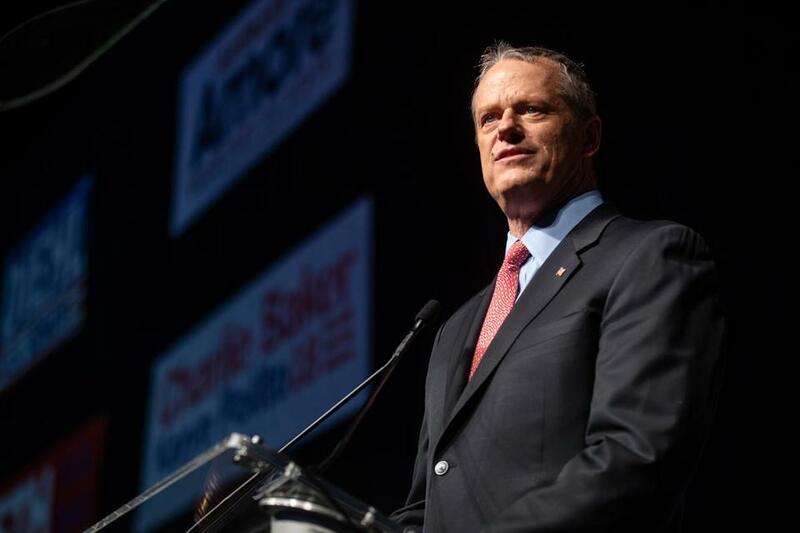 In his speech to the delegates, Baker, who often takes pride in his working relationship with Democratic leaders, set an unusually strong partisan tone, giving a glimpse of the themes he will probably be hitting for the fall election. Never mentioning Lively, Baker boasted that he brought fiscal discipline to Beacon Hill, worked to create a strong economy, began the overhaul of the MBTA, and supported public education. But he also hit some strong conservative issues. He reminded delegates that he backs the death penalty for those who kill police officers, he vetoed a huge legislative pay raise, and he opposed making Massachusetts a sanctuary state. He highlighted his differences with Democrats over immigration issues, drug trafficking penaltieis, and taxes, and got the best applause of his speech. In his remarks, Lively went straight at the governor on issues that drew strong applause from the conservative delegations. He chided Baker for not speaking out against sanctuary cities, his relationship with such Democrats as Mayor Martin J. Walsh and Mayor Dan Rivera of Lawrence, and for his taking credit for a strong economy under Trump. Lively did not mention what he is most known for — his controversial writings about gay people, including his claim that homosexuals controlled the German Nazi Party. Speaking to reporters later, he acknowledged he had “fences to mend” with the LGBT community. Lively ran as an independent candidate in 2014 and got less than 1 percent of the vote. He appeared to serve as a lightning rod for the discontent on the party’s right flank. Dan Cullity, a Whitman resident, said he’s “kind of losing faith” in Baker after his repeated criticisms of Trump. But Robin Almgren, a 70-year-old Tyringham delegate who voted for Baker, defended the governor’s “conservative values,” emphasizing his focus on smaller, more efficient government. “I’m a good Republican. And I think it’s good that he works with all the people in the room,” Almgren said. But she also believes there should be a debate. The party-backed ticket also included three unopposed candidates for state constitutional offices: Anthony M. Amore of Swampscott for secretary of state, Helen Brady of Concord for state auditor, and state Representative Keiko M. Orrall of Lakeville for state treasurer. Democrats are scheduled to hold their convention June 2 to endorse one of two candidates for governor: Jay Gonzalez, a onetime state budget chief, and environmental activist Robert Massie. Globe correspondent Matt Stout and Joshua Miller of the Globe staff contributed to this story. Frank Phillips can be reached at frank.phillips@globe.com.